Review Ultrazyme Universal very happy with this product which I have used for many years. Review Ultrazyme Universal good value product. Review Ultrazyme Universal I think that this helps my vision, is clear, and non-irritant. Review Ultrazyme Universal I don't think you can rate this product in terms of comfort and vision as it acts within the overall Oxysept cleaning process. However, I have never had any problems with it and it seems to do the job satisfactorily without any adverse affects. Review Ultrazyme Universal I have been using this product for over 35 years and I am totally happy with the manner in which it keeps my Contact Lens. Opticians constantly compliment me on the excellent condition that the Lens are kept. Ultrazyme Universal My lenses are a lot more comfortable ever since I started using Ultrazyme Universal in conjunction with my solution. Ultrazyme Universal Easy to use and cleans thoroughly. Ultrazyme universal is a powerful addition for your cleaning solution, that’s still gentle on your eyes. Designed to remove the build-up of proteins after every day wear, this fast acting solution restores optimum vision in your lenses and ensures your contacts stay fresh for longer. Ultrazyme Universal comes in the form of a tablet, ready to be dissolved in your cleaning solution. This increases the power of your solution, scrubbing them completely clean of any protein deposits overnight. For the best results, we recommend you combine these tablets with AMO’s Easy Rub, Total Care or Oxysept 1Step at least once a week. Each pack contains 10 tablets, which should be enough for over two months of regular effective usage. 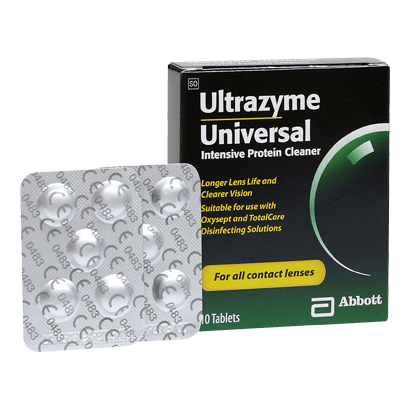 Ultrazyme Universal Backs up and enhances the action of your normal cleaner for a new quality of vision and comfort.